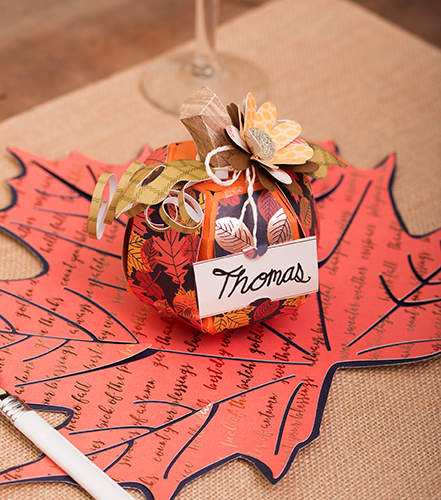 This project lets you creatively decorate for a fun, autumn party! Using a personal die cut machine, cut out a 12” solid leaf from the black cardstock sheet. Cut out an additional leaf (11-3/4”) from a coordinating print in the stack. The leaf can be exactly the same as the first (one solid form) or can show the veins like the one in the image. Adhere the two together, the smaller in the center of the larger leaf. Using a personal die cut machine, cut out a small 3D pumpkin shape with the orange cardstock sheet. Select a coordinating print from the stack; add a section of the print to all the side panels of the pumpkin (*Note, the pieces need to be slightly smaller than the orange cardstock panels to create a matted effect). Assemble the pumpkin, creating a 3D ball. Using another coordinating print in the stack cut out a 3D stem for the top of the pumpkin. Assemble and adhere in place. Embellish the top of the pumpkin with a variety of flowers (button goes in the center of the flowers), leaves, and a twine bow. Looking to make several place settings? Be sure to give yourself one or two days!